(Maharishi Vedic City, IA) News today that violent crime in America has fallen to its lowest levels in nearly 40 years may have baffled authorities but comes as yet another confirmation of the effectiveness of the “Invincible America Assembly” at Maharishi University of Management and in Maharishi Vedic City, Iowa, where for the past five years thousands of advanced Transcendental Meditation experts have assembled to demonstrate the power of group meditation for reducing societal stress and therefore cutting crime and violence in America. For information and to interview Dr. Hagelin, please contact Ken Chawkin at +1-641-470-1314 or kchawkin@mum.edu. Click on the title to listen to the interview. Meital Dohan talks to Jerry Yellin. They discuss how TM helped him emerge from his PTSD as well as how TM can help better the mind and body in other ways, given that Meital also practices. They discuss the effects of PTSD and how drugs are not the only answer to the hardships and trauma of War. Jerry Yellin is a World War II Veteran who suffered from PTSD after returning home from the war. For many years he suffered from depression that he could not escape, and fell deeper and deeper with no end in sight despite being surrounded by people he cared about and who cared about him. After his wife began to practice Transcendental Meditation, Jerry also tried it. Through TM, which he continues to practice, he got himself out of his depression and has lived a long and healthy life. He speaks widely about his experience and he has has teamed up with the David Lynch Foundation to create Operation Warrior Wellness to provide TM to veterans of our current wars as a way to help heal from the hardships of battle. Listen to other interviews by Meital Dohan and see other articles on Jerry Yellin posted here on The Uncarved Blog. and What To Remember When Waking by David Whyte. The Inner Landscape of Beauty. Paul will be joined by his wife, celebrated Canadian singer/poet Ann Mortifee; Ed Sarath, world-class flugelhorn player; and special guest Eugene Watts, founder of the popular Canadian Brass, the world’s leading brass ensemble with over 80 CDs and DVDs. This concert is also the grand finale of the “Music & Consciousness Symposium” being held at Maharishi University of Management during the weekend of May 14 & 15. Each of these artists will deliver keynote addresses at this Symposium on the subjects of improvisation, creativity, and the relationship of music with spirituality. One of the highlights of the concert is a rare performance inside the Golden Dome on the campus of Maharishi University of Management. The Golden Dome has been used for more than 30 years for the collective practice of the Transcendental Meditation (TM) program by several thousand practitioners. Extensive published scientific research shows the TM technique promotes a wide range of personal benefits, including reduced stress, anxiety, depression, ADHD and other learning disorders. Research also demonstrates a calming “spillover” effect on the whole of society when just a small percentage of the population practices this technique together, including decreased crime, violence and conflict throughout society. The event is presented by the David Lynch Foundation and MUM’s new Creative Musical Arts Program. Tickets are available in advance at the Chocolate Café, on the Square, and the MUM Bookstore. For more details on the “Music & Consciousness Symposium,” visit: mum.edu/music/symposium. 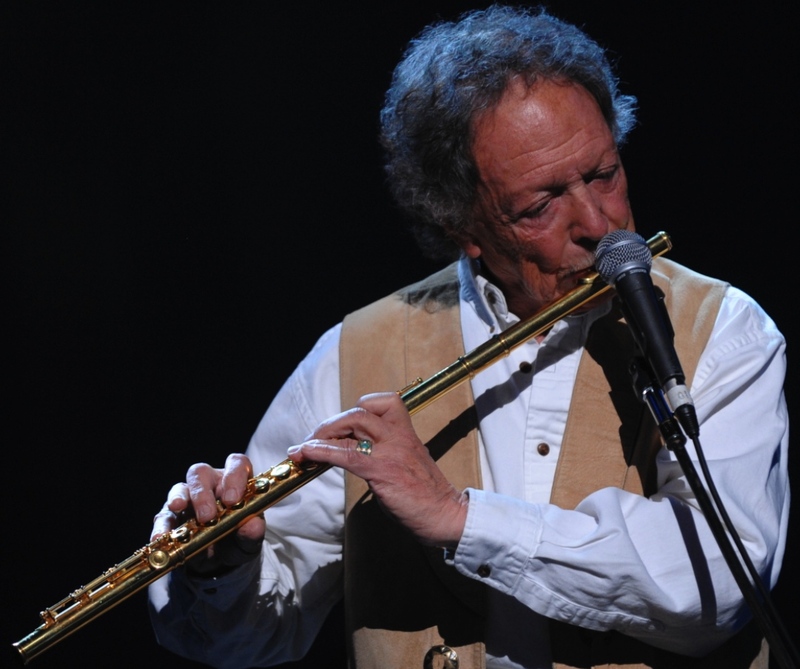 Also see Radio Iowa interview Famed flute player visits SE Iowa, plans weekend show, and IowaPrivateColleges.org posting: Grammy Winner Paul Horn Performs at MUM. PeaceTown, USA also posted: Sacred Intersection: Paul Horn Performs Inside the Golden Dome. Visit the TM Blog for an article posted by Keith Deboer: Paul Horn: The Music of Meditation, and a short video overview of Paul Horn’s career: Inside Paul Horn posted by annmortifee. Here’s Paul’s great talk from the symposium: Improvisation: The Ultimate Art of Self-Expression — Paul Horn at MUM. Results of MUM’s first Music and Consciousness Symposium: Why a Symposium on Music and Consciousness? Click here to see all of the Lecture and Performance Videos from the Symposium including Q & A. Every day before class, Visitacion Valley Middle School students pass an informal memorial known as the “R.I.P. wall,” a reminder of trouble that awaits them when the afternoon bell rings. In 2004, two students discovered the partially decomposed body of a 19-year-old stabbing victim. Later that year, a gunman brazenly stormed into the school, threatened to kill a teacher and robbed two employees. In the 2009-10 school year, one-fifth of the students had one or both parents incarcerated. In the spring of 2007, Dierke decided he would try a simple solution. The quiet time program involves the ancient techniques of transcendental meditation, conducted twice daily in 12-minute sessions before and after class. The first announcement comes over the school’s intercom around 8:45 a.m. — “Prepare for quiet time,” — and the teachers ring a little bell to mark the beginning of the exercise. Most students close their eyes; others cover their faces with their hands and focus on the repetition of a mantra. Dierke and the school staff credit the program with reducing violence, increasing attendance and test scores and dramatically decreasing suspensions. Other good things are happening, too, teachers said. The volleyball team made the playoffs this year for the first time in a long time, and some of the eighth-graders are making it into The City’s top high schools, such as Lowell. Most of the annual $175,000 funding for the program is provided by the New York-based David Lynch Foundation, founded by the TV and movie director. The money is used to pay for dedicated staff to run the quiet time program. Opponents call it “stealth religion” that violates church-state separation laws because of its association with Eastern religions, but advocates insist that the practice predates Hinduism by thousands of years. A handful of San Francisco’s troubled public schools have turned to a transcendental meditation program known as quiet time to relieve high stress in students, made possible by grants from the New York-based David Lynch Foundation. The TV and film director launched the foundation in 2005 with support from two surviving members of the Beatles and their former meditation instructor Maharishi Mahesh Yogi. But foundation leaders say the practice has nothing to do with religion and is not a church-state separation issue. Save some minor grumbling and initial skepticism, the San Francisco version of school meditation has not experienced nearly the opposition faced in 2006, when the foundation withdrew funding after parents at Terra Linda High School in San Rafael denouced it as a cult. Bob Roth, the foundation’s vice president, said the programs in San Francisco have gotten better reception. Ellie Rossiter, executive director of the nonprofit Parents for Public Schools of San Francisco, said she has heard no opposition to the program. Some of The City’s school officials have even provided testimony on the Lynch Foundation’s website. “It’s an anchor, it’s a balance for them and I believe it opens them to learning,” Everett Middle School Principal Richard Curci said in a YouTube video. The meditation program at Visitacion Valley Middle School was instituted in the spring of 2007. 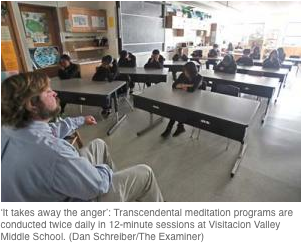 Related articles: San Francisco Bay Area News: From time-out to quiet time: meditation comes to SF schools | New research shows Transcendental Meditation improves standardized academic achievement | MindShiftKQED: How we will learn: Amidst Chaos, 15 Minutes of Quiet Time Helps Focus Students | and this TM Blog report with video: Breaking the “predictive power of demographics”: SF principal talks about how TM helps his students. And here’s a wonderful report from the The George Lucas Educational Foundation (GLEF): Edutopia: SF School Uses TM to Overcome Problems. We chose spark … because we wanted to write stories that would get people thinking—that would spark ideas and curiosity. So this magazine is intended as a catalyst—something to inspire you to have new conversations. … And what sparks conversation and change more than differences? And being open to those differences and letting things inspire us? Our biggest feature story, written about Maharishi University of Management in Fairfield, Iowa, is perhaps the most genuine example of what it means to be open to this spark of inspiration. l can’t remember how I first heard about the Maharishi, but I was shocked to find out the whole school practices Transcendental Meditation every day. No one in Des Moines seemed to know about it, and I got in my head that it must not be a real school. It couldn’t be. But writer Josie Berg-Hammond was determined to get the real story and see what it was all about. She came back from her visit smiling from ear to ear. Before l’d even read her story, she was so excited about it. She met so many new people and they were all so friendly. They told her about their schedules, how they eat organic foods, meditate every morning, are in bed by 10 p.m. and only take one class at a time. It all sounds so different from Drake, but the people, the core of the Maharishi community, are still just people … just like us. Their university experience has been a little different from ours, but they sparked thoughts in Josie, and that comes through in her story. The differences between two university communities sparked new relationships and conversations, and what is life about if not those new adventures? This article was featured in their EVOLUTIONS section of the magazine. Most high school students look forward to college as a time of new experiences: new friends, new classes, new parties. One thing most students don’t think about: meditation. For students at Maharishi University of Management (MUM) in Fairfield, Iowa, however, that’s at the top of the list. The four-year, accredited university was founded by Maharishi Mahesh Yogi. The school, originally called Maharishi International University, took over the campus of a recently closed university in 1974 and opened its doors to hoards of students eager to learn through Consciousness-Based education. Now, the school has 1,233 full-time students, both undergraduate and graduate. While the school has many non-traditional students going back for second degrees or graduate school, there are many more students who arrive fresh out of high school. Four years ago, when he was a high school senior, Brian Faulkner, 22, had a tough decision to make. He could go to a school where he could continue playing soccer or go to MUM where he could continue practicing Transcendental Meditation (TM). “Now I feel like, thank God I came here,” Faulkner says. Faulkner has been practicing TM since he was about 4, and it was important to him to continue the practice through college. Even though he had been in the habit for a while, Faulkner said his friends were surprised when he decided to go to MUM. “It’s not a cult,” says first year student, Supriya Vidic, 26. Vidic started school at Maharishi after six years of military service. She says she was ready to reach an inner peace she felt she was missing while she served in the military. Many students find MUM because they’re looking for something different. Students want to focus on themselves just as much as on their schoolwork. For most, the regular practice of TM is crucial to their educational journey. First year students are enrolled in an introductory course when they first begin at MUM. This gender-separated experience helps ease students into the MUM way of life. One of the most important things students learn in the class is how to practice TM. TM is not something that someone can begin on his or her own. While anyone can learn, the practice must be taught. In its most basic form, TM is the practice of closing the eyes, sitting still and settling the mind. Students and professors alike believe TM allows the mind to transcend to a point of pure awareness, allowing the mind to rest deeply and the brain to function with more coherence. Fred Travis, an MUM professor, says it takes about four days to learn TM and about six months to stabilize it. Students meditate for 20 minutes in the morning and 20 minutes in the afternoon or evening. Travis said this rests the brain and is crucial to Consciousness-Based education. “You settle down to pure wakefulness,” Travis says. A healthy vegetarian diet, low homework load and TM are all a part of MUM’s system of Consciousness-Based education. Classes at MUM are set on a block system. This means that students go to one class five days a week from 10 a.m. to 3 p.m. Students are completely immersed in one course for a month and then take a three-day weekend and start up another month-long course. Professor Travis has spent his career crusading for Consciousness-Based education. He suggests that a switch to this type of learning creates a less stressful, more fruitful academic experience for both professor and student. “Consciousness-Based education says that the student is the core,” Travis says. The method encourages less homework, more class time on one subject, sleep, exercise and a healthy diet. Students are encouraged to be in bed by 10 p.m. and are never assigned more than an hour and a half of homework each night, leaving them time to hang out with friends or join extra-curricular groups. Travis believes that this type of lifestyle is much better than the classic education model. Most students at other universities take about five classes a semester and spend varied amounts of time on homework—all-nighters fueled by energy drinks—for different classes, which often leads to a sporadic schedule. Travis doesn’t think that’s right. Travis also finds the class structure of traditional universities lacking. Instead of a lecture class with a final exam at the end, he believes students should be interacting with each other and the professor in order to retain information. “Final exams are structured forgetting,” Travis says. “With active learning, the professor stops talking and lets the students talk. Just like any other college campus, MUM has a cafeteria where many of the students eat three meals a day. But MUM’s cafeteria is 100 percent vegetarian with mostly local food and vegan options. And in a world of pre-prepared meals, the MUM cafeteria relies on fresh ingredients every day, often newly harvested from its own garden. Though most people would find the food at MUM to be a huge step up from the classic cafeteria fare, it’s not always easy to get accustomed to it. According to Ila Zeeb, the director of the first year experience at MUM, students don’t always like the food right away. “For some students, this food is a huge change from home,” Zeeb says. While many students do enroll as vegetarians, others are confronted with a completely different diet. Graham Torpey, 24, who graduated from Syracuse University and is now a graduate student at MUM, is thrilled with the meal offerings. The students are also knowledgeable about what food is offered in the cafeteria. Brooke Hadfield, 28, a second-year student from Australia, says it’s important to her to know about her food. Once their bellies are full of organic quinoa and locally grown vegetables, many students head back to their dorm rooms for the evening. Of the 1,233 full-time students at MUM, 544 live on campus. At MUM, students have a single room to themselves, which the university cites as a way to ensure that students have their own quiet, private space. The dormitories don’t discriminate based on age or gender. That means at MUM, where there is an abundance of nontraditional students, a 20-year-old could have a 60-year-old student for a neighbor. Students don’t seem to mind, though, embracing the opportunity to live in harmony with any age. Although Des Moines may be the “big city” of Iowa, MUM’s home city, Fairfield, has a pretty bumpin’ social scene. Faulkner described the downtown area as “an oasis of creativity.” In a town of about 9,500, Fairfield has more restaurants per capita than San Francisco and a booming art and music scene. Along with its resident university, Fairfield provides young adults with unique social experiences. Students and professors at MUM are the first to admit their school is different from most. Transcendental Meditation and Consciousness-Based education are crucial to their academic and personal life. Students are joined together not just by school pride, but also by a deeper journey of self-exploration. To see how the article actually looked, click on this title, Students find their center at Maharishi, to download a pdf of it. This article originally appeared in Drake University Honors Magazine, Spring 2011. The staged photos taken by photographer Sarah Andrews and used with this article actually have nothing to do with our students. That was one of the editor’s decisions for the colorful layout. Final note: As part of her final school project, Josie creating a website linking Iowa farmers to Des Moines chefs who are serving their food. So if you’re planning on eating locally in Des Moines, check out the Capital Palate. See this article by Grandview University journalism students: Maharishi University featured in ALT magazine. This post was moved to: Students find their centers at Maharishi. I’ve removed the old post and replaced it with this newer one. You can access it here: Students find their centers at Maharishi. Now you don’t have to download the pdf of the article to read it, unless you want to see how it was laid out, and I’ve edited down the editor’s letter to the relevant section. It’s an excellent article, and a great example of an intelligent, open-minded student from a different university who was curious enough to want to find out what MUM was all about. She shares what she learned from visiting with students, faculty and administrators at MUM in this wonderful article. Enjoy and share this with anyone who may be curious to find out more about Consciousness-Based education at Maharishi University of Management, especially potential students. They can always come to one of our Visitors Weekends and experience for themselves what it’s like to be at MUM.